This joint work with Marcel Montrey and Thomas Shultz combines — to be consistent with the interdisciplinary theme of this symposium — ideas from biology, economics, a little bit of cognitive science, and the approach is through applied mathematics. This post is a transcript of a presentation I gave on March 27th and covers part of my presentation today at Swarmfest. Any good story starts with a colourful character, a complicated character, and — to be complacent with modern leftist literature — an anarchist intellectual well-versed in (but critical and questioning of) Marxism; enter Pyotr Alexeyevich Kropotkin. Today he is best known as one of the founders and leading theorist of anarcho-communism, but in his time he was better known as an anti-Tsarist revolutionary, zoologist, geographer and explorer. 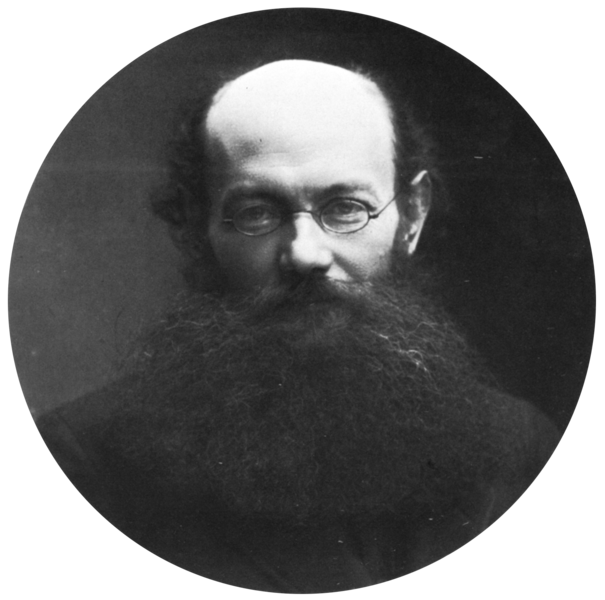 Kropotkin was born to the Prince of Smolensk, a descendant of the Rurik dynasty that ruled and eventually unified many of the Principalities and Duchies of Rus into the Tsardom of Russia. By the 9 December 1842 birth of our protagonist, Russia had been under Romanov rule for over 200 years, but the house of Rurik still held great importance. Even though the young boy renounced his Princely title at age 12, he was well-off and educated in the prestigious Corps of Pages. There he rose to the highest ranks and became the personal page of Tsar Alexander II. Upon graduation this entitled Kropotkin to his choice of post, and our first plot twist. Analogous to the irresistible pull of critical theory on modern liberal-arts students, the young Kropotkin was seduced by the leftist thought of his day: French encyclopédistes, the rise of Russian liberal-revolutionary literature, and his personal disenfranchisement with and doubt of the Tsar’s “liberal” reputation. Instead of choosing a comfortable position in European Russia, the recent graduate requested to be sent to the newly annexed Siberian provinces and in 1862 was off to Chita. This city has a personal significance to me, it is where my grandfather was stationed over 100 years later and most of my mother’s childhood was spent there. Chita has become a minor place of pilgrimage for modern anarchists, but it (and the other Siberian administrative centre at Irkutsk) did not hold Kropotkin’s attention for long. Unable to enact substantial change as an administrator, he followed his passion as a naturalist. In 1864, he took command of a geographic survey expedition into Manchuria. Having read Darwin’s On the Origin of Species when it was published 5 years earlier, Kropotkin embarked on a distinctly Siberian variant of the HMS Beagle — sleigh dogs instead of wind to power his way. His hope was to observe the same ‘tooth and claw’ competition as Darwin, but instead he saw primarily cooperation. In the harsh environment of Siberia, it wasn’t a struggle of beast versus beast, but animal against environment. From 1890 to 1896, Kropotkin published his Siberian observations as a series of essays in the British monthly literary magazine, Nineteenth Century. Motivated as a response to Huxley’s “The Struggle for Existence”, the essays highlighted cooperation among nonhuman animals, in primitive societies and medieval cities, and in contemporary times. He concluded that not competition, but cooperation, were the most important factors in survival and the evolution of species. Kropotkin assembled the essays into book form, and in 1902 published Mutual Aid: A Factor of Evolution. A magnum opus on cooperation, much like E.O. Wilson Sociobiology of nearly 75 years later, Kropotkin started from the social insects and traced a common thread to the human society around him; he was the first student of cooperation. Under plentiful conditions, D. discoideum are solitary predators of bacteria, which they consume by engulfment. If the environment deteriorates and the amoebae begin to starve, then they enter a social stage. Using their quorum-sensing mechanism they check if enough other amoebae are present in the area and then aggregate into a mound. They coat themselves with a slime (that gives them their name) and move together as a unit, until they find a good location to fruit. The slime mold then extends a stalk up from the soil with most cells forming a spore at the top. At a certain height, the spore is released, allowing the amoebae at the top to disperse to greener pastures; the cells in the stalk die. Since all the cells are free-living independent organisms during the non-social stage, this shows the clearest form of altruism: fellow D. discoideum sacrificing their own lives in order to give their brethren a chance at a future. Sadly, most evolutionary game theory models assume constant population size and no resource variability. In these models, it is difficult to introduce a parameter analogous to environmental austerity. To allow for resource limitations, we need to introduce variable population sizes and thus create an ecological game. I explored this modification for a Hammond & Axelrod-like model back in the summer of 2009 and thought I would share some results here. The agents inhabit a toroidal lattice, and each round the agents interacts with their 4 adjacent neighbours via the Prisoner’s dilemma. The payoffs are added to their default birth rate, reproduction is asexual and into adjacent empty sites. At each time step, each agent has a fixed (0.25) probability of expiring and vacating its site. The worlds start empty and are gradually filled with agents. This figure has three graphs; in each figure the line thickness represents standard error from averaging 30 independent runs. The leftmost graph is the proportion of cooperation versus cycle, with two conditions for default birth rate: 0.24 (high austerity; top line) and 0.28 (low austerity; bottom line). The two figures on the right show the total number of cooperators (blue) and defectors (red). The rightmost graph has time flowing from right to left. The left panel is high austerity (def ptr = 0.24) and the right panel is low austerity (def ptr = 0.28). Above are the results for a Prisoner’s dilemma interaction with — a rather competitive environment. Matching Shultz, Hartshorn, & Kaznatcheev (2009) and consistent with Milbiner, Cremer, & Frey (2010), we can see an early spike in the number of cooperators as the world reaches its carrying capacity. After this transient period, the dynamics shift and defection becomes more competitive. The dynamics settle to a stable distribution of cooperators and defectors. The proportion of cooperation depends heavily on the environmental austerity. In a harsh environment with a low default birth rate of 0.24, the agents band together and cooperate and in a plentiful environment with high default birth rate of 0.28, defection dominates. As Kropotkin observed: cooperation is essential to surviving environmental austerity. Analogous to the results from the Hauert, Homles, & Doebeli (2006) ecological public-goods game the proportion of cooperation tends to bifurcate around default birth rate equal to to the death rate (0.25), although I don’t present the visuals here. The increase in default birth rate results in a slight increase in the world population at saturation, but even by raw number there are more cooperators in the high austerity than the low austerity setting. Thus, it is not simply defectors benefiting more from the decrease in austerity (since defectors go from a regime where clusters are not-self sustaining (def ptr = 0.24) to one where it is (def ptr = 0.28)), but also an effect of defectors out-competing and disproportionately exploiting and crowding out the cooperators. Each graph is evolutionary cycles versus proportion of cooperation, line thickness is standard error from averaging 30 independent runs. Environmental austerity decreases from the left graph (where default birth rate is equal to death rate) to the right (where their ratio is 1.1). The blue line is the model where agents can discriminate based on arbitrary non-strategy related tag (the green-beard effect/ethnocentrism are possible) and the green line is simulations where no conditional strategy is possible. If agents are allowed to condition their behavior on an arbitrary tag then the ethnocentric population is better able to maintain higher levels of cooperation as environmental austerity decreases. In the tag-based model, it would be interesting to know if there is a parameter range where varying environmental austerity can take us from a regime of humanitarian (unconditional cooperator) dominance, to ethnocentric dominance (cooperate with in-group, defect from out-group), to a selfish (unconditional defection) world. I am also curious to know how the irrational hostility I observed in the tag-based harmony game (Kaznatcheev, 2010) would fare as the environment turns hostile. Will groups overcome their biases against each other, or will they compete even more for the more limited resource? Nearly 150 years after Peter Kropotkin’s Siberian expedition, the curtain is still up and basic questions on mutual aid in austere environments remain!